Food That’s Fast, Not Fast Food! 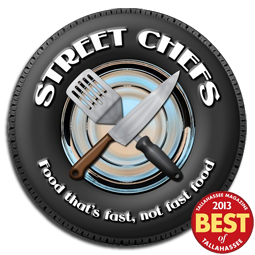 Street Chefs is a mobile restaurant located in Tallahassee, Florida. Comfort food made with fresh healthy ingredients makes Street Chefs a haven for nostalgic dining. Chef Rebecca Kelly-Manders approaches classic recipes with a modern twist. The result? A menu of familiar yet unique items like “Not Your Mama’s Grilled Cheese”, meatloaf your mama will be jealous of, and a black bean burger that even carnivores will devour. Street Chefs is a mobile restaurant providing lunch and dinner to the greater Leon county area. Established in 2011, the Street Chefs Mobile Diner provides a quality dining experience that is quick and convenient. Rebecca Kelly-Manders is a Certified Culinarian through the American Culinary Federation and has been a professional in the food service industry since 1997. She has worked in corporate kitchens, local catering companies and also teaches private cooking classes. Formerly a general manager of a national Quick Service restaurant, she was awarded GM of the year in 2009. Rebecca is a hamburger connoisseur and devout Mets fan. 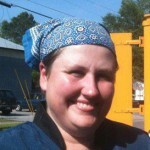 Chef Rebecca Kelly-Manders is the owner/operator of Street Chefs food truck.